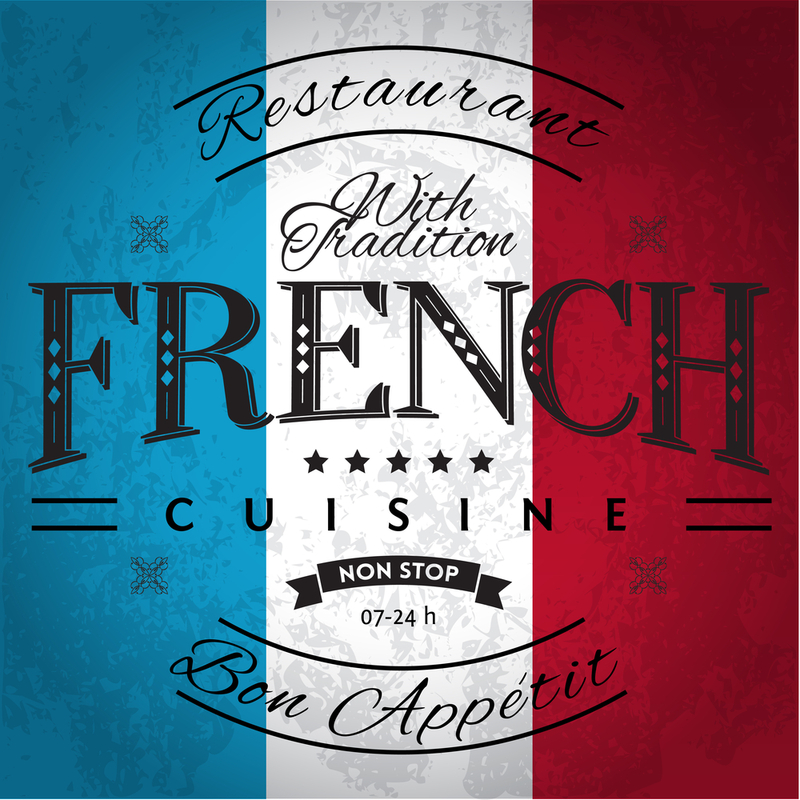 French Language Recipes: Unlock the exact meaning of those ingredients and cooking methods lost in translation! Even easy french recipes can create an obstacle course of unknowns in the process of translating the components of a simple recipe. Maman, as I might have already mentioned, was born and raised in a small town in north eastern France. In school, she learned just enough English to converse with the American troops who regularly drove their trucks through town on the road to the Ardennes front. She would eventually marry one of these GIs and find herself living in postwar Germany in 1946. One day, she set out to impress my father’s friends with a home cooked meal. It was a real treat as post war Berlin was not exactly conducive to dining out. Wondering about life in post war Germany ? Difficult at best even for the lucky ones! Papa, who had a serious sweet tooth, made a quick trip to the Commissary. He returned with a can of apples, a few small packs of sugar and some flour. Apple pie for dessert! The main part of the meal was a breeze to prepare. However, when it came time to make the apple pie, Maman did not understand a few words – one in particular – in a recipe on the back of the can. She figured that word could not make so much difference in the context of the recipe. She had the main ingredients! So, she skipped right over the part about preparing the pie crust. She mixed the dry ingredients with the contents of the can. It was quickly obvious that dessert would not resemble either a pie or une tarte. Very proud of her English speaking skills, Mom’s foreign language lessons did not translate into a edible piece of pie. Maman became a superb cook, envied for her culinary skills, memorable diplomatic corps dinner parties and receptions but she never forgot her apple pie experience. As a little person, I stood on a chair to watch and help both my great-grandmother and grandmother prepare meals and baked goods. I have vivid memories of wandering through the potager (our vegetable garden) to gather nearly all the ingredients we needed for dinner. In the late 1940’s, we did not have access to any type of grocery store. Protein in the form of meats mainly consisted of horse (yes), liver, kidneys, venison and assorted game, fish or fowl from the farm where we picked up our milk, eggs and butter. Every so often – when the butcher made his rounds – Grandmère would buy a special cut of beef or pork for a super treat. I can still taste the steak tartare! Recipes were very simple, incredibly tasty and all prepared by rote. Those were the days when the ultimate wedding gift was your grandmother’s cookbook. Maman received great grandmère’s treasured cookbook – the cookbook she used to run a Word War I canteen. Every day, she fed off duty soldiers a simple meal. Her menu featured a single dish and a single dessert. Watching her cook was an experience! No cookbook, no measuring of ingredients, season to taste and cook. Et hop, fini! 60 ml eqals 4 Tablespoons! How much rum in that glass? About 50-60 cubic centimeters – in other words, a little over 2 ounces or Grandmother’s generous 4 tablespoons! 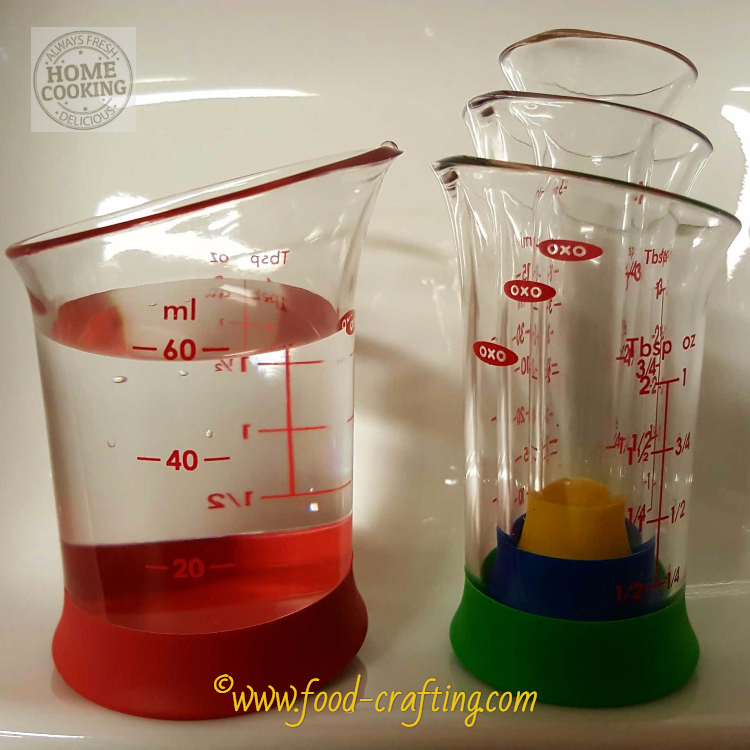 This cute mini measuring cup makes it easy to measure liquids. Allow me to illustrate how a quick and easy French language recipe (or one written in English! 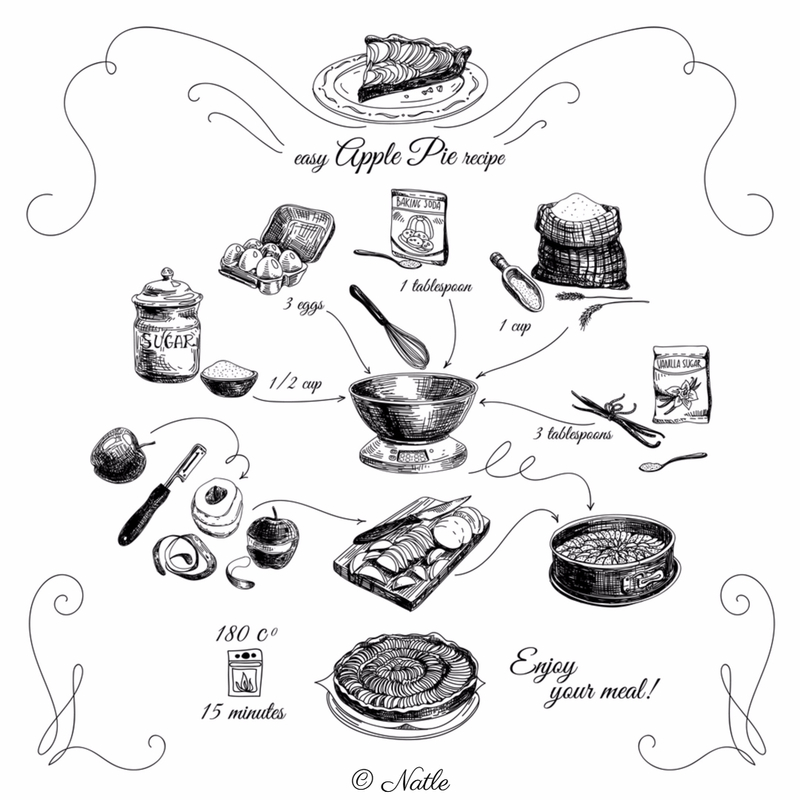 ), especially a vintage style recipe, might become lost in translation, even for a basic apple pie! Checked with Maman and she agrees – it’s the perfect recipe to use as a example! Early on in my cooking experiences, I noticed that French language recipes are – how can I say this – très vague. Vintage French recipes clearly assume that the home cook has already mastered most of the basic cooking techniques, has all the proper kitchen equipment (in this case, tart pans) and can guesstimate oven temperatures. I still have no idea how my grandmothers knew just how many sticks of kindling had to be added to the stove in order to reach the ideal “baking” temperature! The simple wood stove did not have any gauges. Controlling stove top temperatures consisted of moving the pan off the burner. 🙂 Would love to say that our kitchen stove was as fancy as the one pictured here but it was not. First, let’s look at a recipe written in French then translate it into English. It’s from a chunky little cookbook published in 1958. The book is full of recipes written in what I consider to be typical of the “vague” style of writing often found in vintage recipes. You may very well come across this writing style in newer recipes. It has been my experience that older recipes are written to assume that the cook is familiar with most cooking methods. 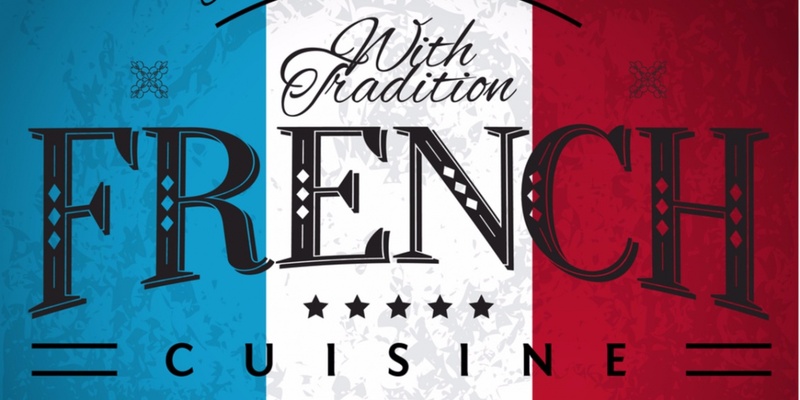 Can You Find Authentic Ingredients For That French Language Recipe? When using vintage and current French language recipes, I find that many ingredients are not available locally. It is possible to order them online but we don’t often plan ahead that far when preparing weekly meals. Holiday recipes are another matter – I do plan ahead and make sure I have authentic ingredients and cuts of meat or fowl. The idea is to prepare these recipes to taste as close to the original as humanly possible. We’ll prepare several recipes from old cookbooks and current French food magazines to illustrate how we substitute certain ingredients without sacrificing the flavor of the original. Make a small investment in metric kitchen gadgets to open up a whole world of new recipes! Fonçez une tourtière beurré pâte abaissée à 1/2 cm. Recouvrez-la de tranches de pommes se chevauchant. Saupoudrez de sucre et cuisez à four modéré. Line a buttered pie pan with the dough rolled out to 1/2 cm or less than 1/4 of an inch thickness. Cover the pie crust with overlapping apple slices. Sprinkle with sugar and cook at medium heat (approximately 150 degrees Celsius or 302 degrees Fahrenheit – moderate heat). Need To Translate A Recipe Written In French? Don’t let a single word or two in a French language recipe keep you from preparing a scrumptious meal. We’re about to add to the cooking lexicon with mini vocabulary lessons. Just drop us a line in the comments section – we’ll be happy to help you translate any recette écrite en Français! 4.1 Can You Find Authentic Ingredients For That French Language Recipe? I love the story about your mom’s apple pie. Don’t we always remember our biggest cooking disaster? I know I do: over salted pasta sauce. UGH!